Richard A. Register Department of Chemical and Biological Engineering, Princeton University, Princeton, New Jersey, 08544, USA. The order-disorder transition of a sphere-forming block copolymer thin film was numerically studied through a Cahn-Hilliard model. Simulations show that the fundamental mechanisms of pattern formation are spinodal decomposition and nucleation and growth. The range of validity of each relaxation process is controlled by the spinodal and order-disorder temperatures. The initial stages of spinodal decomposition are well approximated by a linear analysis of the evolution equation of the system. In the metastable region, the critical size for nucleation diverges upon approaching the order--disorder transition, and reduces to the size of a single domain as the spinodal is approached. 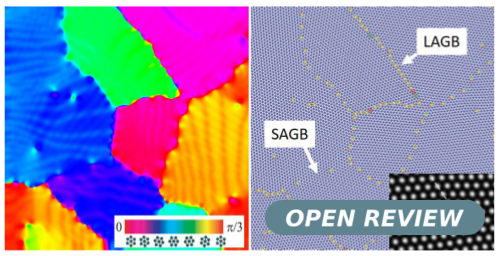 Grain boundaries and topological defects inhibit the formation of superheated phases above the order--disorder temperature. The numerical results are in good qualitative agreement with experimental data on sphere-forming diblock copolymer thin films. This paper, by L R Gómez, N A García, R A Register, D A Vega, is licensed under the Creative Commons Attribution License 4.0.